The world’s first titanium hemipelvis transplant has taken place. An Italian teenager suffering from osteosarcoma has had half his pelvis replaced by a titanium transplant in what medics at Turin’s university hospital centre are stating is a world’s first. Osteosarcoma is a type of bone cancer that tends to occur at the sites of bone growth, it is the proliferation of osteoblastic cells in this region that lead to the transformation of cells. The tumour may be localized at the end of the long bone, commonly in the metaphysis, and most often it affects the proximal end of tibia or humerus, or distal end of femur. Osteosarcoma is the most common histological form of primary bone cancer and is most prevalent in children and young adults. Osteosarcoma is the eighth-most common form of childhood cancer, comprising 2.4% of all malignancies in pediatric patients, and about 20% of all primary bone cancers. Standard therapy is limited to a combination of limb-salvage orthopedic surgery when possible and amputation in some cases combined with a high-dose cancer drugs. The 18 year-old patient, who lives in the province of Turin, had responded fairly well to well 16 cycles of chemotherapy in the Centre for Orthopaedic Trauma (CTO). 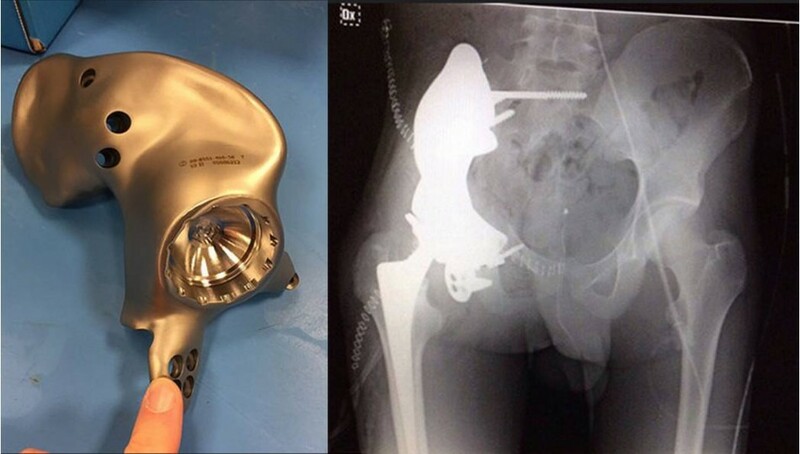 Meanwhile, parallel to the traditional tumour therapy, orthopedic surgeons of the CTO had half a titanium pelvis built in the US and had it coated with tantalum, a material that is fully compatible with human bones, tantalum is a non-corrosive mainly used in electronic components. The prosthesis was made to measure from a cast taken from the patient’s CT scan. The operation was performed at the hospital Regina Margherita of Turin by Raimondo Piana, director of orthopedic oncology surgeory, and Alessandro Massè, director of orthopedic surgery, the operation lasted about 12 hours, and involved removing the right-hand side of the pelvis and hip affected by the tumour and replacing them with the prosthesis. The surgical team state that the operation had an excellent outcome and the patient is now undergoing intensive therapy to help him adapt to his new pelvis. With this intervention the team state that they have developed another important weapon to use against the cancer for the medical community. The Centre for Orthopaedic Trauma (CTO) in Turin has performed the world’s first pelvis transplant. Credits: AOU City Health and Science of Turin. This is wonderful! i have the same problem, but i had Ewing sarkom in pelvis, and its removed in 2002 , i dont know what to do now, the operasjon was in Norway, and now i am 21 years old girl, and they say to me that they cant do anything about this, and all that make it realy painful. because i cant go on in my life, i cant work or get married because of this. i really need help and i dont know where to go. please … if u can tell me how much will a such operasjon cost? and if its something i can do in the first place?! I would like to inform you that this surgery is not the first done in the World. I had all 3 areas of my pelvis replaced with titanium prosthetic made in California, USA. My surgery was February 01, 2001 in Seattle, WA done by Dr. James Bruckner. I can provide documentation of surgery and xrays of my implant. There isn’t an option to attach a photo or I would.